Here's the premise: a standard form factor for a pluggable, swappable pc on a card. 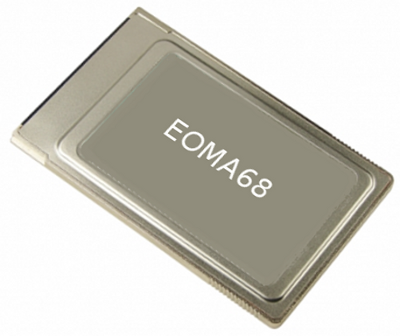 The EOMA68 CPU cards have the CPU, GPU, system RAM, Flash drive, and IO controllers such as SATA, USB, Ethernet, SPI, HDMI, LCD, etc. all in a small self contained metal shelled card that is pluggable into all types of products. The physical plug is the same as used for the old PCMCIA cards. This is no great leap forward technologically -- just putting the guts of a smartphone into a card, essentially. And nothing to get too optimistic about, as getting a common standard adopted is much rarer and more difficult than creating a technical innovation. But let's talk about why this would be cool for schools. The most obvious advantage of this is just lowering the TCO by making it easier to fix or partially upgrade. The most obvious disadvantage is that it's going to be a bit bulkier than a sealed tablet. The architecture shouldn't make much difference in cost one way or another. If you make it possible for the user to swap CPU cards, it could address some of the increasingly divergent requirements between high stakes testing and security in schools, and giving students some sense of freedom, creativity, exploration and privacy in their computing lives. You could pop in a very strict, minimal, secure (un-networked) system for testing, have another for working in school (your Amplify card, perhaps), and students could buy their own for, say, under $50 if they want to be in complete control of their tablet at home. It would also be easy to make cheap alternative form factor devices for any or all of the above cards. A little dock that would let you use your TV as a computer monitor, or simple laptop or desktop chassis when that would be desirable. Just pop the card out of the tablet and into one of the other devices. Your working environment follows you. You could also use the cards as the brains of robots and other types of computer-driven projects. The problem is that this model disrupts the tablet industry by breaking it up into commodity parts. They prefer the all-in-one model. Consumers like it to. Hey, I love that my iPhone feels like it is just a solid seamless block and don't mind that I can't open or upgrade it. But I also accept that essentially nothing used in a school is as sleek and refined as its best commercial version. It is just the nature of the beast. Basically, we need a Jeep or Beetle version of the tablet for schools, and splitting the CPU card out into a cartridge would make that possible.